Devapriya is a Physician Assistant by qualification and practice and is Vice President – Product Innovation at Attune. She has over 10 years of experience in patient care, clinical research and product design and management in healthcare. Devapriya started her career as a practicing Physician Assistant in emergency cardiology in Madras Medical Mission, a prestigious hospital in Chennai before she moved to Attune during the organization’s founding days. In her past venture, she has managed international clinical trials, hospital operations for critical care unit and has played an active role in clinical research work. Devapriya has over a dozen national and international paper publications to her credit. At Attune, Devapriya is responsible for concept, design and functionality of healthcare IT products. 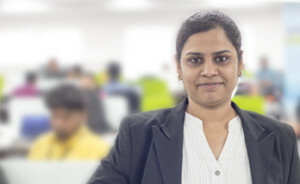 She is involved in each stage of product life cycle development and works closely with teams across functions – from pre-sales, market analysis, sales & marketing, design, testing, implementation to support to get customer insights that translates to product enhancements. Devapriya has a bachelor’s degree from BITS, Pilani in Physician Assistant studies with specialization in Cardiology and a post graduate degree from NLSIU, Bangalore in Medical Law & Ethics. Devapriya is passionate about music and performing arts and used to be an avid badminton player.